The flow is like that: the dangerous operation has the fuse as a shell. The first state, “closed fuse”, has a counter of failed invocations and a threshold. When the client produces an invocation, it allows the invocation to pass through. If the call succeeds, then resets the counter. If it fails, increment the counter. If the counter reaches the threshold, it disables the fuse, going to the “open fuse” state. This state has a variable that represents an ammount of time and another one representing the moment in time when it has become the active state. Any call to the dangerous operation in this state will cause it to fail without even invoking the operation. When it is in this state for the amount of time specified in the variable, it decides that the call deserves another chance. So the invocation goes to the “half open fuse”. This state tries to invoke the operation again. If it fails, go to the open state again, resetting the timer. If it succeeds, go to the closed state again, resetting the counter of failed invocations. OK, nice pattern, but what does it have to do with SOA? As Michael himself doesn´t give any hints on the implementation of such a pattern, I decided to implement it, and you can download it from the downloads section. It is very simple, as it doesn´t allow only web services to be invoked via the pattern, but any other kind of dangerous operation too. You can modify the code the way you want to achieve your desire. My hint is that, allied to stuff like AOP and interceptors in general, you may do it the ultimate solution to never, ever have this kind of problem again. What is BPEL and its purpose? 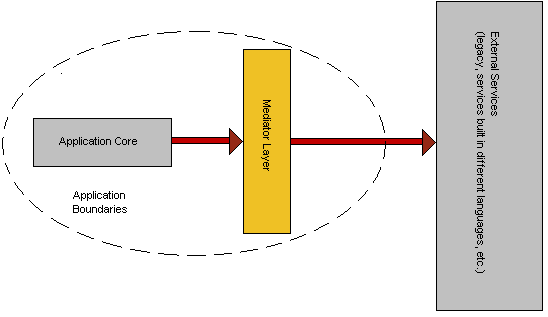 The BPEL specification aims to achieve between web services orchestration. However, the interaction between services often requires, translation of complex objects to other complex objects. If there are variations between input parameters or output, some parts of the process should be partially or completely redone, making it difficult to maintain this. The BPEL specification provides standard elements which facilitate the addressing of complex issues, such as waiting for a certain time interval before proceeding with certain tasks. However, most common cases in BPMN, as the interaction with humans, there is no standard specification. This turns out to be the burden of specific tools such as Oracle BPEL – which makes the process strongly coupled to a vendor . BPEL is a tool that should be used on systems that have had the development cycle ended. The tool is primarily for service orchestration – which does not mean it should be taken as the only means to do so. What I mean is that if a system is developed in a single programming language, is a high probability that integration done within the scope of this language is better and faster than using BPEL tools. Thus, BPEL is ideal for orchestration between separate services for creating new – but should not be used to create basic services. Explained my reasons, I say I have been using BPEL for any SOA project. It is inevitable to say before starting a project that has claim to be SOA, ask yourself if it is SOA or just SOA-Ready . Most systems do not need SOA-Ready BPEL, SOA in contrast to systems where the most need. How many different languages are used in the project? If the answer to this question is “more than one”, there is good chance that BPEL fits well in context. Otherwise, consider adapting what already exists before considering the adoption of this tool. Are there business analysts involved in the project? If so, maybe BPEL is well put: because the process can help the understanding between the BPMN and BPEL implementation. Otherwise, BPEL may not be justified. In conclusion … BPEL, like so many other well-established tools, is a fantastic tool. However, it should be able to use. The correct use of certain tools in a project may make its use essential. But the use of wrong tools can make your design to be developed slowly, much more expensive and difficult to maintain. As with any tool misused. Is SOA dead or not? Well, boys and girls … inaugurate this blog as a way to express some ideas about IT and, if possible, share some knowledge. Much of the knowledge that accumulates in IT does not come with critical analysis, ie, managers, architects, developers and almost everyone involved in any way with IT not do an analysis of how important a tool / technology is important for their business / system. SOA serves for what? And to whom? data that will be exposed will be sufficient / excessive? who use my system will be inside or outside the organization? How to ensure that only the right people see the data exposed by my services? These are the concerns that surface when using an SOA implementation. And, somehow, are responsible for the failure of technology to return the ROI and agility that is promised by the vendors of SOA. But these concerns are in development, right? How to ensure that developers will have these concerns? The answer is simple: the developers not going to worry about it. And nor should they. The key to effective implementation of the SOA Governance SOA. Apparently, it’s simple. And it is. The problem is that some companies refuse to systematically implement a governance strategy for thinking that it is not necessary, or because you think the developers alone can meet the data requirements. Turns out, no, developers are not paid to think about the flexibility of future systems, these systems only. And so they do. Then, the deployment of SOA failure every time a project has no SOA governance. This is a very simple logic. 100% of SOA projects that I know that they had failed SOA governance. And then, some people may say “is, but almost all cases of SOA governance have also fail.” And those people I say nothing, show evidence. IBM has a page of success stories for anyone who thinks that SOA is dead. I say the following: SOA is not dead, nor die. Just let people know just apply the knowledge properly.